The magical bunny on stage. Last weekend we took Rosie to the Festival Luluberlu in Toulose, a wonderful children's carnival. Our neighbor, who has a daughter the same age as Rosie, told us about the event and we spent the day there together. What struck me the most about the festival was how culturally different is was to anything I have attended in Australia or America. First of all, the event was free. There was no visible branding or sponsors, no promotional materials for sale, and no fast food. There were a few stalls selling homemade hot meals, and another selling vegan ice cream, but most families brought picnics. The greatest difference, however, was the style of entertainment that had been organized for the children. The first activity we participated in was face-painting. A group of around a dozen children at a time were each given a painter's pallet and their choice of three paint colors. 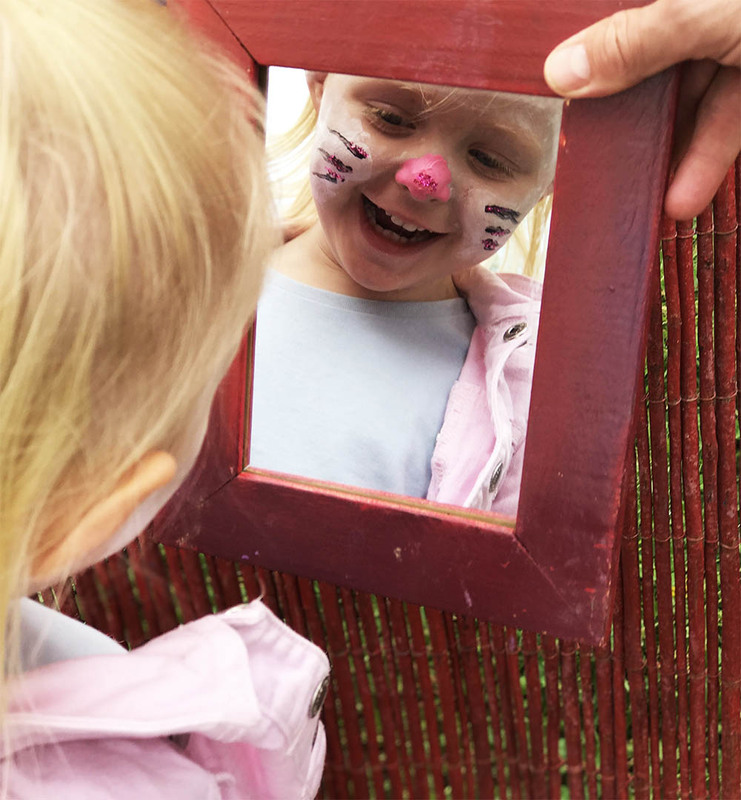 Parents and kids were given a tutorial together on how to apply the paint for the best results, and then left to our own devices in an grassy outdoor enclosure that was strewn with mirrors and painting implements. There were lots of costumed organizers floating around, with stunningly painted faces, offering tips or dabs of glitter. It felt bohemian, and utterly noncommercial. Justin painted Rosie's face to look like Dirty Bunny, by request! There were various other tents set up with different activities. Rosie adored the children's gym, where a team of instructors assisted her through an age-appropriate course of physical challenges involving tunnels, parallel bars, and trampolines - the sort of experience that wouldn't be allowed in many places for reasons of insurance and liability. Another popular tent was set up with a walking course. Kids were invited to walk across sand, squidgy foam, prickly pine cones, etc., to experience different physical sensations on their feet. There was an educational aspect to a lot of the activities, but it wasn’t labored and none of the kids appeared to notice - they were simply having a blast. Another performer, who has the kids completely enthralled in his act - and what a costume! In addition to the workshops, there were a variety of outdoor shows or ‘spectacles’ dotted around the park. 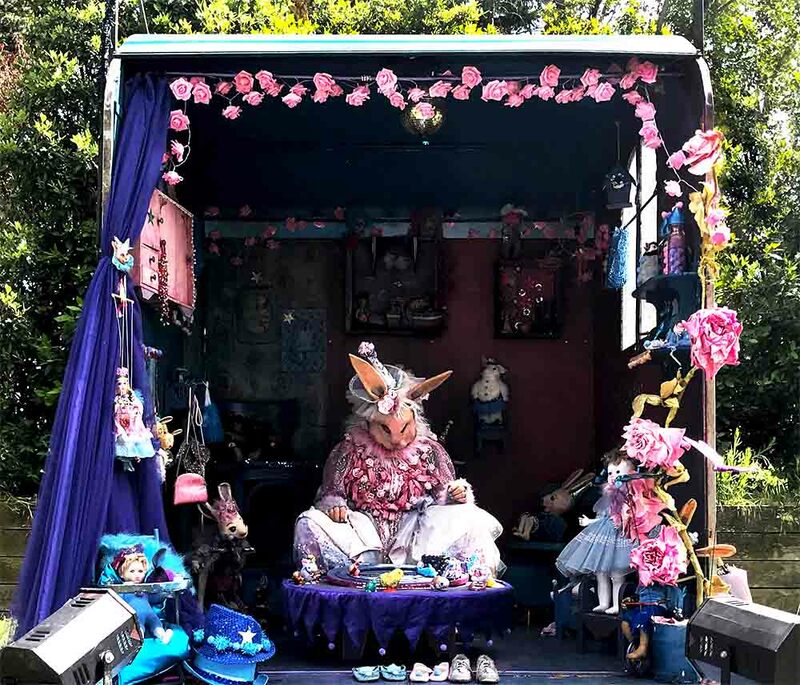 The theme for the event was 'fantastical animals', and there were actors in extravagant costumes performing fascinating vignettes, almost in the style of performance art. There were two mystical creatures on an ornate red stage mending broken hearts, and another elaborate bunny giving life to childhood dreams. The entertainment was so sophisticated; the expectation was that children could handle cultured and artistic performances, and that they would be entertained and engaged, and they were. I couldn't help but wonder if the French, on a societal level, have higher expectations of their children. Or perhaps it is more a case of them not undermining their children with the presumption that things need to be dumbed-down or oversimplified. These creatures are sewing broken hearts back togtehr, with needle and thread. The event was full of music, but none of it was ‘children’s music’. We watched an acrobat on a bicycle do tricks, accompanied by a cello soloist who performed a dramatic soundtrack. There was an installation of giant musical windmills and wind chimes for kids to interact with, and a fabulous four-piece jazz band that got all the kids dancing. The whole event was very inspirational for me as a parent, and it was amazing to have the opportunity to observe these cultural nuances. It was also a good reminder not to underestimate kids - they're full of surprises. P.S. Kids and their world of color.